I am pretty crazy for all things agave–I use the sweetener in my morning tea, love it in my margaritas and count tequila and its spicier, smokier counterpart, mezcal among my favorite spirits. This cocktail is a bit like a spiced margarita, with Génépy, Chartreuse's Alpine cousin, stepping in for Cointreau. Combine ingredients in a cocktail shaker with ice; shake vigorously for 10-15 seconds. 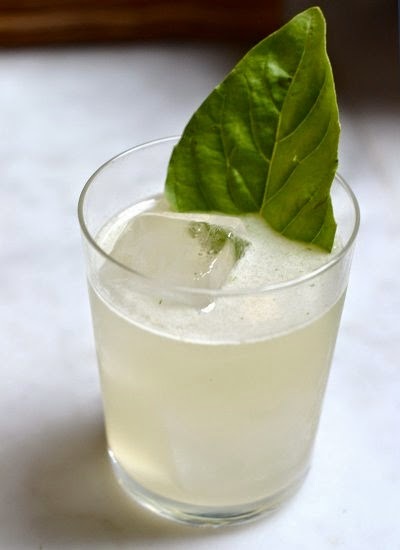 Double strain into a rocks glass with fresh ice, and garnish with a basil leaf. Notes: Génépy might be a bit tricky to find, though speciality liquor stores likely carry it. If you can't hunt down a bottle of the stuff, green Chartreuse will do in a pinch. As for mezcal, this recipe recommends Del Maguey's VIDA, and you couldn't pick a better bottle to start your collection–which will undoubtably grow as you start to explore Del Maguey's single village spirits. Cheers! Image by Natalie Compton for PUNCH.